Hard as it is to believe, we're now into July - so here's a wee round-up of what I've been loving over the past month. ONE: Mason Pearson brushes are regularly touted by celebs and beauty editors as being the best on the market - but man, are they spendy. Last time I checked, the medium brush - with rubber-cushion and boar's bristles - was more than €100. Then I found this one by Denman, which sounds nearly identical - but costs just £12.61 (I ordered from the UK via their website). It's great - the boar bristles are gentle, so this smooths the hair without damaging it and creates a healthy shine. TWO: Chanel's Illusion D'Ombre eyeshadow in Epatant has been a staple in my makeup bag since I bought it a couple of weeks ago. 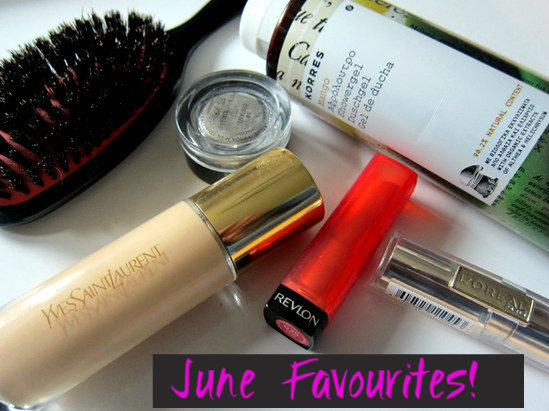 It's all kinds of amazing and for a full review and to see it on my mug, check out this post. THREE: YSL's Le Teint Touch Eclat Foundation launched last week and has taken the beauty world by storm. It gives a gorgeous glow that genuinely takes years off and allows me to look deceptively healthy and well rested, despite one too many recent sleepless nights. For pictorial evidence, see here. FOUR: Korres Mango Shower Gel is the most fruitily delicious shower gel in the whole wide world. It smells just like a ripe and juicy mango and feels really silky and moisturising. I am now on a mission to try every type of shower gel offered by this brand. Check out what I thought of their lip butters here. FIVE: Revlon's Lip Butter in Candy Apple is my favourite shade from this range and is one I've been wearing to work a lot of late. I love that despite the bright bold colour, the fact that it's not fully opaque makes it totally office appropriate. Want to see it on? Check out yesterday's post. SIX: L'Oreal Rouge Caresse in Flirty Fuchsia is a lovely vibrant shade of pink that I've been rocking for evenings out over the past few weeks. You can read more about the line here or see this one in action here. I have the Epatant, it's such a great shade! 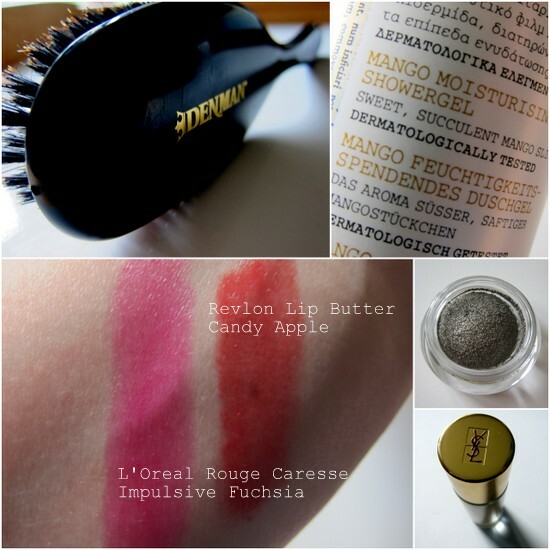 The Revlon lip butters are the best invention since...the toaster! I need a Mason Pearson brush horribly bad. It looks like I am going to have to take the plunge and just purchase one. I used to have a Mason Pearson brush and mysteriously lost it in my last move - which is rather upsetting. I am going to have to try and find a Denman - sounds like it's nearly the same thing. I think I need that hair brush! I'm in love with YSL's Le Teint Touch Eclat. It gives such a gorgeous finish. I need to buy new lip colours this weekend. That L'Oreal seems like a lovely colour. Love that Korres showergel- it is so fruity! I heard about that expensive brush. The price was definitely holding me back from buying it. So glad you suggested an alternative and LIKE it. I want to get it. Looking into the YSL foundation (love) and adore the lip butters. Excellent post girl!